Grill 4 corns using a grill pan or a grill. Once they are ready, set them aside. Cut the sliced chorizo into strips and throw the strips into a frying pan/or grill pan, if using (no need to make another pan dirty if the grill pan has been used for grilling the corns). Wash and cut the pears into quarters. Remove the hard parts before cutting them into cubes. Throw them in the pan. Saute for 2 minutes. Peel and thinly slice garlic. 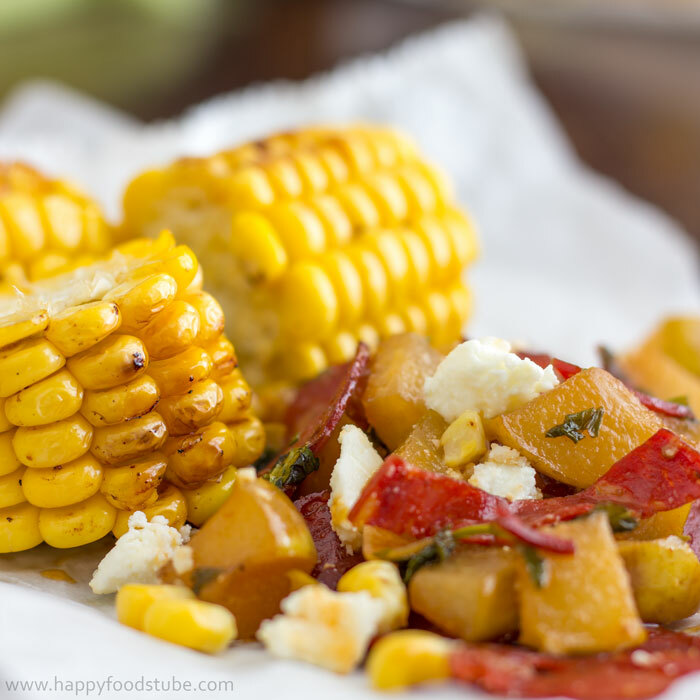 Cut corn of its cob and add the kernels as well as sliced garlic to the chorizo. Add butter and roast for 2-3 minutes stirring occasionally. Now wash and finely chop the parsley and throw it in the pan as well. Add a splash of balsamic vinegar and cook for a further 1-2 before turning off the heat. Cut each cob into 3 pieces and place on a plate. Spoon some of the salad next to it and top with Feta cheese. 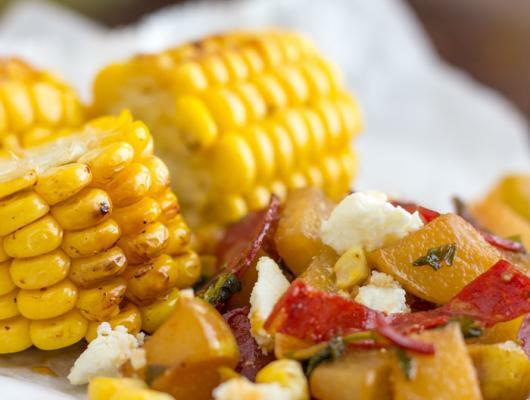 The simple grilled sweet corn has been taken to the next level by serving it with pear chorizo salad!